Grateful Dead at Deer Creek Music Center in Noblesville, Indiana. July 2 & 3, 1995. "We knew from the riot that happened the night before, the 2nd show most likely would be canceled. As we made our way to the Music Center on July 3rd, the police were directing everyone away. The show was off. For the first time in Grateful Dead history a concert was canceled because of the crowd. A black cloud had suddenly descended on Dead Land and we were feeling its effects from all 4 corners. 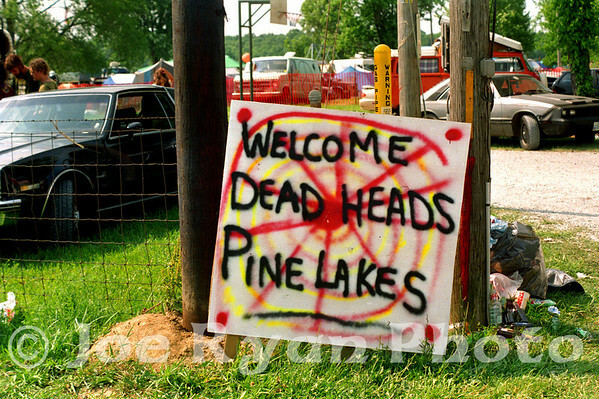 These photographs help document our experience of Deer Creek '95. After hearing of the cancellation we hung around for several minutes, just long enough to get my photos... then headed back to our tent, packed up & made a bee-line for St. Louis."